I was recently reading a list of things that brides would consider worthy of a splurge for their big day. Lots of things made the list for these brides to be. Photography led by a mile. Look back up at the picture above. I just want you to imagine the picture above with each girl holding a single gerbera daisy. 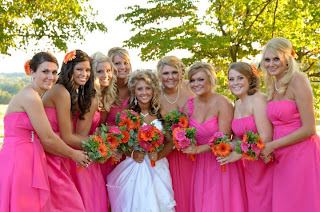 And the bride with a bouquet the size of the bridesmaids. avoid cutting down on the flowers. 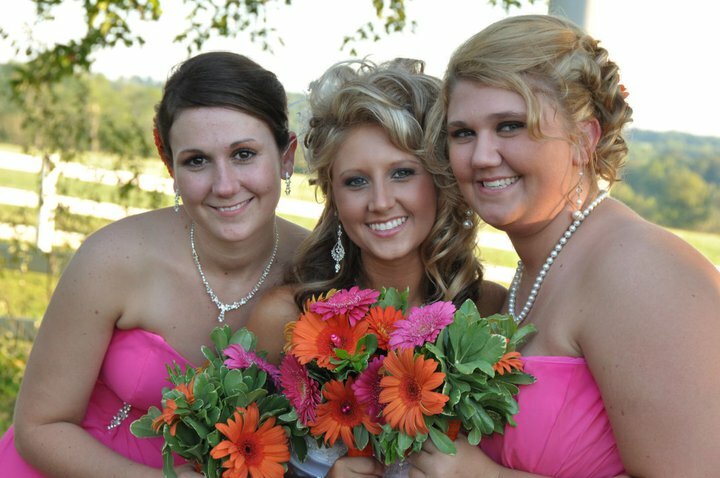 Flowers are the transition between brides and the environment AROUND the bride. They transform not only the space, but the bride. They are an accessory to the people, the places, the day. The pictures above are from one of my favorite brides from last year. She works very very hard. She is a full time student and full time employee. Was her wedding my biggest? THIS little dynamo wanted flowers, and plenty of ’em. It was a priority to her, and she carved out space from her VERY hard earned money to have flowers. And look at this beautiful bride, with her beautiful flowerS! Glad the groom does, too. Jodi, I so agree! Flowers are the most important to me because I want a lasting MEMORY, not something I take away as a memento nor even the photo to keep looking at it. I want the heavenly feeling of God's creation at a God event. His beauty is expressed in flower diversity and I revel in it. My daughter had flowers LAST and she is already over budget so I am going along with her priorities, but (sniff sniff) it was hard to let go. She wanted photography and videography and LIGHTING. well, the lighting will REALLY show up the flowers we get! Lighting will help, but ya can't light whatcha aint got! LIGHTING is SO important. Its a challenge to convince clients how it totally enhances the setting. It makes what you DO have look like so much more. So glad you are a flower lover, too.